Much is likely to be written in the media concerning Sir Louis Blom-Cooper whose death at his home in London was announced on September 20, 2018. He was 92. I will not repeat here the details of his illustrious career, which are bound to appear elsewhere, rather mention a few anecdotes. We met at various events over the years when I always found it odd that (though there were more important people to talk to) he would seek me out to discuss some legal point or other, often concerning his latest campaign for justice. But I had worked with his late-wife Jane through the Magistrates' Association and assumed that was why he knew me, especially as that work had sometimes been controversial (which he relished) and no doubt discussed back at home. It began before I became a law publisher, so it was not to do with that. Whatever, he soon became a regular acquaintance then a friend in his own right. Only later did he start to talk about the books he was writing, or endlessly planning, frequently sending manuscripts and entire works in progress. To the very end his brain, always fine and lucid, was in top gear, and he wrote in a compelling, easy, accurate and flowing style that (though details sometimes needed verifying) was as near perfect as it gets when an author sends something to a publisher. I became a kind of a sounding board (no doubt among many others) and I recall the many occasions when he came to my home to discuss projects, almost always travelling to see me and being picked up at Basingstoke Railway Station rather than the reverse. I recall one day when he arrived with Professor Terence Morris directly through the flower beds and shrubs having lost track of where the entrance was. On rare occasions when I went to see him, it was at The Athenaeum, or Middle Temple where the highest-ranking judges and lawyers in the land would stop and engage in conversation despite their no doubt pressing schedules. Everyone seemed pleased to see him. They all seemed to have time to talk to him. 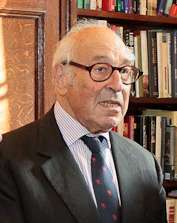 We published one of his life's works Fine Lines and Distinctions: Murder Manslaughter and the Unlawful Taking of Human Life (with Terence Morris) for which Lord Judge, Lord Chief Justice, no less, wrote the Foreword and the launch of which was attended by most of the higher judiciary and other luminaries. But writing was just part of his life, and he was nothing if not well-connected. That book was followed by two pamphlets around murder for HOMRAG (Modernising Justice) the rarefied group of 'experts' that he chaired. He was still writing and planning their next paper a couple of weeks before he died. The times we discussed legal (and political) issues are legion. He had a reputation for keeping people locked to the end of such debates. One of my favourite memories of him will not just be of him as a lawyer but sitting in the sun in his shirtsleeves, trying to persuade me to publish some embryonic but not quite wholly defined book he was considering writing. The germ of something new built around a long-held passion. It turned out, somewhat ironically, to be The Power of Persuasion, but even more ironically it was taking a lot to persuade me that it was viable. I was invited to join 'his' HOMRAG which initially focused on defects in the law of murder, but that was working with Sir Louis, when he died, on an opinion that Brexit is not just legally questionable but wholly unlawful. From the days when he was one of the few truly knowledgeable people campaigning against the death penalty, he was never deterred by political momentum or siren voices. Hopefully, people will not forget or ignore his views on how the mandatory life sentence for murder came about as an instant political fix and not an embedded and long-term solution to abolition. I once asked him how he chose the members of his committee of 'experts' expecting some acid test to have been applied. But for someone so precise in other things he did his reply was surprising: 'Oh, they are just people I like'! Nice to have been liked by Louis then. The law has lost one of its stalwarts and legal writing one of its most fearless advocates. He will be greatly missed.